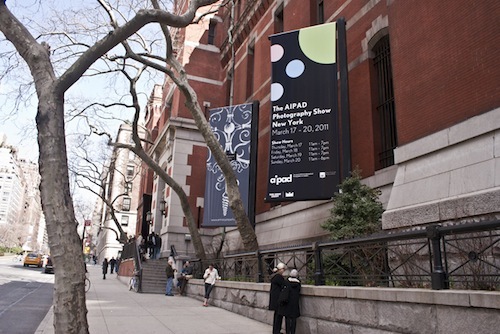 Recently, the Seventh Regiment Armory in New York City became la chambre de la lumière for four straight days during the annual photography show sponsored by AIPAD, the Association of International Photography Art Dealers. It was, as it always is, a bunkerised registry of the history of photography as well as its contemporary state in most of its manifestations. Set out in an organized array of booths (art cubicles) the event housed 82 galleries in miniature, who, themselves, were exhibiting an assortment of their respective catalogues. In this years show, the strength lay in the bookending and layering of processes and sizes used by contemporary artists. Historic processes and mixed media applications commingled with digital uses of photography, while intimate, obviously handmade pieces shared space with gargantuan slickly produced photographs. At Catherine Edelman (Chicago), several works from Myra Greene's project Character Recognition were presented sitting in plastic holders hanging from the wall. Intimate in their size (3 x 4 in. ), Greene adopted the use of the wet collodion process (in this case Albumen on black glass) in a conscious bridging between the lusciousness and inconsistency of the process, the intimacy of the size and imagery, historic ethnographic classification and her own experiences with and examinations of personal and current public bigotry. Across from Greene’s pieces hung early works from Robert and Shana ParkeHarrison. More intimate in size and modest in concept than the recent Counterpoint series, these works reveal the beginnings of their methods; prints that are an amalgam of different media and methods of production pieced together to complete the picture in non-traditional forms (see Sweeping Study (1994) 10½ x 9¾"). This amalgamation of process continued at HackelBury Fine Art Limited (London) who displayed works from several different series of Mike and Doug Starn, famous for their use of bits in assembling rather largely layered pieces, to the work of Kamil Vojnar, represented by VERVE (Santa Fe), who utilizes various aspects of layering photographs on photographs, hand coloring, painting with varnish and printing on canvas, to the prints of Jungjin Lee’s Wind at sepiaEYE (NYC) whose process involves coating handmade paper with liquid light (traditional silver emulsion) resulting in gorgeous landscape sized (30 x 57") pieces. The intimate prints of Allison Rossiter (Yossi Milo, Stephen Bulger) stood out as a balancing between old (Harry Callahan, Frederick Sommer and Aaron Siskind) and new, (Hiroshi Sugimoto, Sinichi Maruyama). Created entirely in the darkroom by dripping developer on expired photographic paper, Rossiter’s images become assembled visual illusions alternating between abstract and ephemeral landscape imagery (see Acme Kruxo, exact expiration date unknown, ca. 1940s, processed in 2010 and Kodak Kodabrom F2, expired March 1940, processed in 2007). Another notable series, exhibited by Minneapolis based Weinstein Gallery, was Alec Soth’s current body of work “Broken Manual,” (printed as pigmented ink prints at or around 32 x 40”) Presented as an investigation into the places people escape, the notion of assemblage takes place in the more traditional journalistic approach of compiling several, non-typographical works, into a larger scheme and completed with text by Lester B. Morrison into a “manual” instructing those interested on how to “escape”. The AIPAD photography show is an overwhelming photographic experience; something that takes days, weeks, and even months to sort through mentally and requires an “escape” in its own right. The event was chocked more of great than not so great work as well as the usual suspects, new voices, obscure/unknown picture makers of the past, and plenitude of process use. Of course, and completely expected, in listening to many of the conversations taking place, one notices the downside of the event; that the selling of the work seems to outweigh the individual voices of the artists, the incredible visual objects they’ve thrown out into the world and their ability to cause instantaneous discussion. Although, as an event focused on dealing, it managed to provide a jumbled yet intact web displaying the amazing interconnections of artists and the global state of photography (in this case as seen from the eyes of their sellers and collectors) in pure amalgamated form that hopefully sticks with viewers after they’ve left the photographic armory that is AIPAD’S photography show.